De roeping van het merk SECURIFLAME, al 15 jaar lang ontwerper en ontwikkelaar van producten op het vlak van vuur, bestaat uit het aanbieden van innoverende producten die ervoor zorgen dat het gebruik van schoorstenen en barbecues een waar genoegen in alle veiligheid is en blijft. De beroepsethiek van het merk SECURIFLAME ligt in de inachtneming van de elementaire regels van Innovatie, Kwaliteit, Veiligheid en Assistentie. Veiligheid/Onderhoud, Vuur/Aansteken, Onderhoud/Renovatie en Genoegen. Het Merk SECURIFLAME selecteert zijn producten aan de hand van zeer nauwkeurige criteria zodat het zijn klanten de allerbeste kwaliteit/prijs verhouding kan bieden. Onze producten worden continu getest en ontwikkeld om de consumenten een optimaal product te kunnen bieden, een speerpunt product op basis van de allerlaatste chemische en technische ontwikkelingen gestaafd door octrooien. Het Merk SECURIFLAME exporteert zijn producten naar 27 landen, in Europa, in de Verenigde Staten, Canada en Zuid-Amerika. De producten SECURIFLAME zijn beschikbaar in de grote supermarkten, bouwmarkten en tuincentra. Every time you burn wood in your fireplace, it gives off tar. In the course of time, the tar builds up in your chimney. Tar is an inflammable substance which can cause a fire in your chimney. 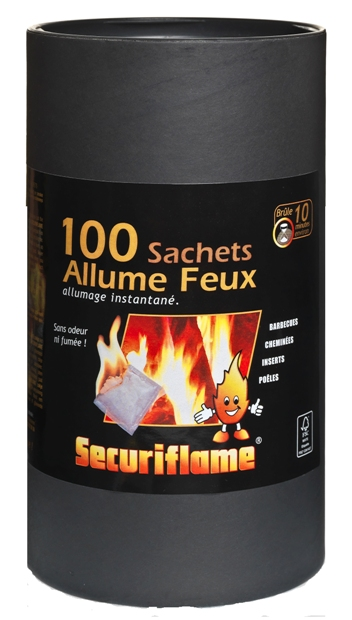 SECURIFLAME chimney-sweeping log contains a mixture of special mineral salts which disperse during combustion. The minerals are released with the smoke and attach themselves to the tar. There is a catalytic reaction lasting one or 2 weeks. During this time, the tar can become brittle. If you continue to use your fireplace, the heat given off by the fire will continue to process the tar, causing it to disperse as a fine powder. There is barely any risk of the remaining quantity of tar causing a fire. 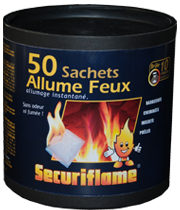 During treatment, SECURIFLAME chimney-sweeping log will continue to burn, even after the flames are extinguished. This is part of the normal application process. Ensure that the damper is left wide open until combustion is complete. 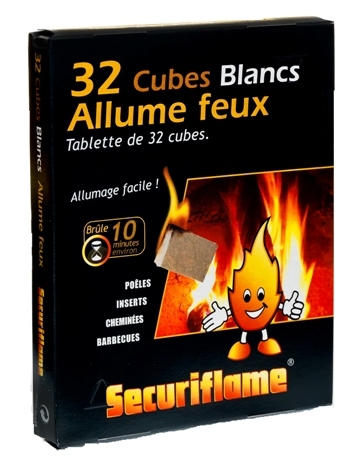 Whenever possible, allow a few hours to lapse between using SECURIFLAME chimney-sweeping log and lighting another fire. If you use your wood stove constantly, most of the tar particles will disperse because of the heat and the flow of air caused by the fire. Using SECURIFLAME chimney-sweeping log does not mean that annual mechanical sweeping is no longer necessary, but it will be easier and more efficient. After using SECURIFLAME chimney-sweeping log , wait one or two weeks before sweeping the chimney mechanically because it will be easier to remove the tar after treatment is complete. The residue of SECURIFLAME chimney-sweeping log must not be ingested by humans or by pets. SECURIFLAME chimney-sweeping log has undergone the most intense studies ever, carried out by OMNI (an independent laboratory, leader in the United States) into flue fouling, enabling it to offer previously unequaled efficiency and safety. In addition, test report No. 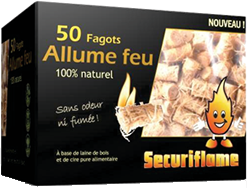 PE 96 50 31 on SECURIFLAME chimney-sweeping log by CNPP (Centre National de Prévention et de Protection, recognized as a public utility service) certifies that SECURIFLAME chimney-sweeping log is non-toxic. In addition, the efficiency of SECURIFLAME chimney-sweeping log has been acclaimed by the Construction Fire Safety Center, TNO Construction (a European laboratory with ISO 9001 accreditation No. 97-CVB-R1556). 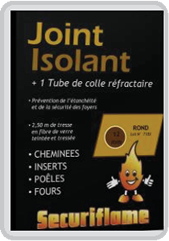 Tests by CSTB (Centre Scientifique et Technique du Bâtiment) have demonstrated the efficiency of SECURIFLAME chimney-sweeping log with and without mechanical chimney sweeping (EN-CAPE 06.180C-V1). Scale: Scale consists of heavy series tars, resins and intermixed with soot. It condenses faster than water vapor and is deposited in the lower parts of the flue. Tar: Products resulting from the non-combustion of volatile coal material issued by fireboxes with discontinued use. Bister: Liquid with a high water content, containing particles of carbon and empyreumatic oils. Soot: Comes from part of the unburnt volatile coal, deposited as an agglomerate with tars and condensed resins, and also with combustion particles under the effect of the draft. Creosote: strong smelling liquid extracted from various wood tars by distilling. Congratulations on buying a SECURIFLAME chimney-sweeping log . Independent test results reveal that the use of SECURIFLAME chimney-sweeping log reduces tar deposits in flues. 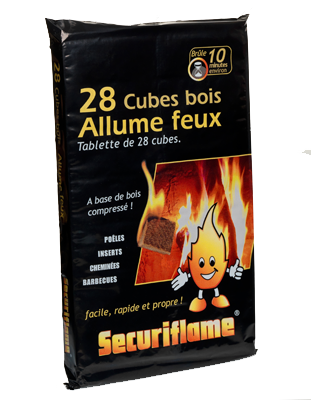 SECURIFLAME chimney-sweeping log has been a great success since 1996. This success has resulted in its use in more than 20 countries. 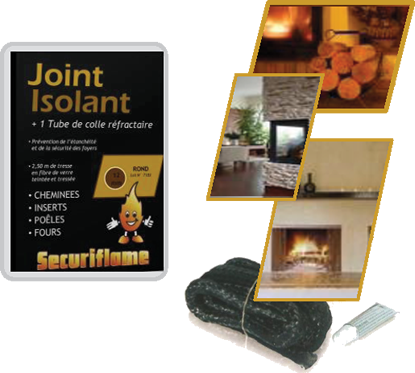 Using SECURIFLAME chimney-sweeping log in a fireplace can contribute to rendering the tar more brittle. This facilitates subsequent mechanical sweeping which becomes cleaner and more efficient. The more tar there is in your chimney, the more important it is to clean the flue. It is important to bear in mind that SECURIFLAME chimney-sweeping log will not indicate whether your chimney is blocked or damaged. Only a qualified expert can establish the condition of your chimney. The quantity of tar in a firebox or a wood stove depends on the installation and state of the equipment, the quality of the wood and its humidity, and how often the installation is used. Less efficient equipment and green or damp wood generate more tar and may require more frequent cleaning. Depending on how often you use your installation, the amount of tar buildup will vary. The greater the temperature difference in the flue, the greater the tar build-up will be. For instance, a flue used constantly will be less fouled than a flue used once a day. Before using SECURIFLAME chimney-sweeping log , check your chimney and flue visually to ensure that there is no debris, birds’ nests and the like obstructing it. Never use SECURIFLAME chimney-sweeping log for the season's first fire in your chimney. Use your chimney in the normal way 2 or 3 days before using SECURIFLAME chimney-sweeping log . Make sure that the chimney damper is wide open. If you have a catalytic filter, close the bypass and set it in the "inactive" position. Leave the catalytic filter in the bypass mode for one or 2 weeks, corresponding to the treatment time. SECURIFLAME chimney-sweeping log is not corrosive and will not damage the chimney flues. It can be used in every hard built type of chimney, and in every stainless steel lined flue. SECURIFLAME chimney-sweeping log can be used in complementary chimneys, inserts, closed hearths, wood or coal stoves and wood boilers. 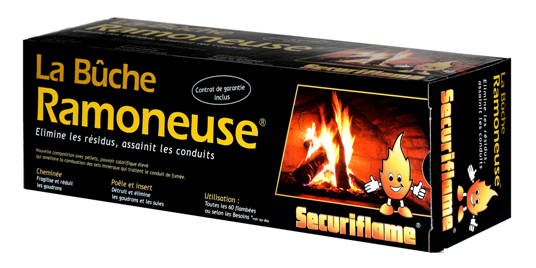 Do not use SECURIFLAME chimney-sweeping log in artificial electric or gas fires, or in barbecues. SECURIFLAME chimney-sweeping log must never be used in stoves operating exclusively on oil. 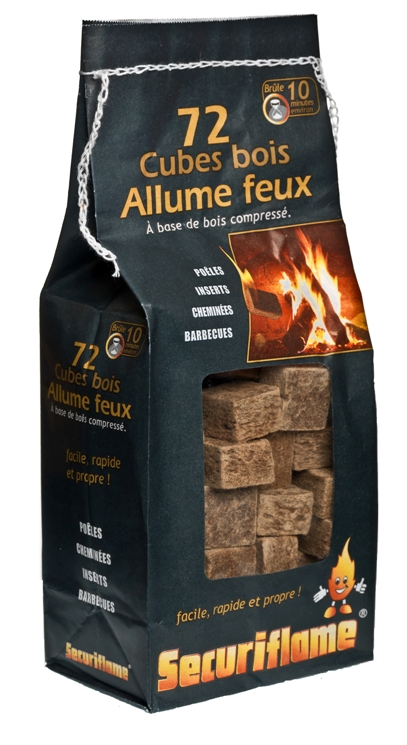 To guarantee the proper combustion of SECURIFLAME chimney-sweeping log , detach the packaging slightly in order to form a pocket of air between SECURIFLAME chimney-sweeping log and the wrapper. This will enable the log to burn more efficiently. For the best results, when you are using only one SECURIFLAME chimney-sweeping log , put it on the hot embers remaining after a normal fire. 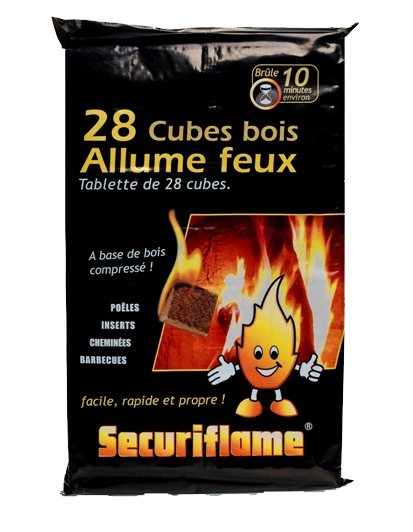 When you use 2 SECURIFLAME chimney-sweeping log s, do not put them on the hot embers as they would burn too fast. Never put SECURIFLAME chimney-sweeping log into the burning flames of a fire. SECURIFLAME chimney-sweeping log can burn on its own. However, putting it on hot embers will prevent the fire from backdraft (smoke blown down towards the fireplace) while SECURIFLAME chimney-sweeping log continues to burn even after the flames have gone out. Most often, backdraft is caused by bad draft conditions in the room. If necessary, open a window or a door and carefully arrange paper in the fireplace so that the draft returns to normal. Make sure that all the fans (central heating, ceiling, etc.) are off when you are using SECURIFLAME chimney-sweeping log , including the fans in the other rooms, such as the bathroom or kitchen. 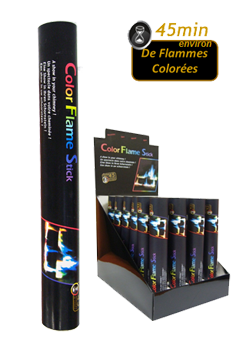 If SECURIFLAME chimney-sweeping log fails to ignite, set light to each end of the package with a lighter or a match. Close glazed doors and open the air inlets of your wood stove, then reduce the openings when combustion is sufficient. Close any protective screens. One feature of wood stoves and inserts it is that they produce large quantities of tar inside the chimney flues. Using a single SECURIFLAME chimney-sweeping log in a wood stove or insert will reduce the weight and thickness of the tar. Accordingly, to preserve your inserts or wood stoves in good condition, be sure to follow the instructions given in the following table. Week-end -1 Log Log at the beginning or in the middle of the season. Use one log at the beginning and in the middle of the season. Continuous fire - 1 Log / two months Use a Log regularly to prevent the tar from building up. Small chimney or small flue - 1 Log Use one log for every 60 fires, to ensure effective maintenance. Large chimney or large flue - 2 Logs To fragilize and dry the tar so that it is easy to sweep and scrape away. Open fireplaces produce less tar but are often more difficult to sweep. Because of the strong air draft, open fireplaces produce less tar than wood stoves but nevertheless require your attention in the course of time. Accordingly, use SECURIFLAME chimney-sweeping log to make the tar more brittle and facilitate mechanical sweeping. 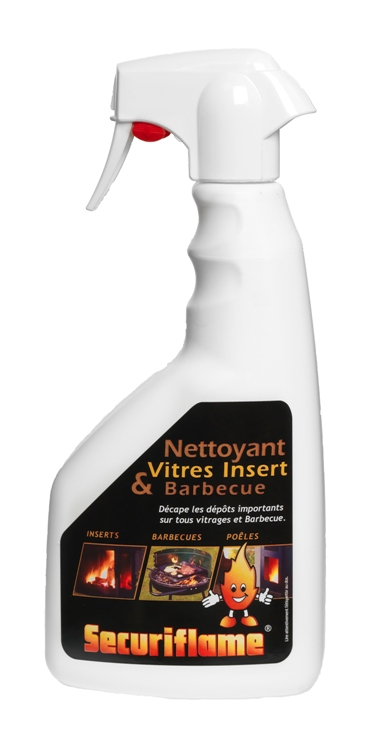 Never use SECURIFLAME chimney-sweeping log in propane or gas stoves, barbecues or stoves running exclusively on oil. Never use SECURIFLAME chimney-sweeping log for cooking. Never add wood or other materials to the fire once you have put SECURIFLAME chimney-sweeping log in the fireplace. Never try to remove a SECURIFLAME chimney-sweeping log from the fire while it is still burning more smoking. 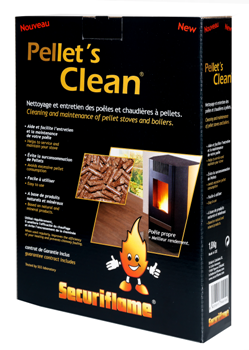 Never burn more than one SECURIFLAME chimney-sweeping log at a time in a wood stove or chimney insert. Leave all the residue of SECURIFLAME chimney-sweeping log in the fireplace. 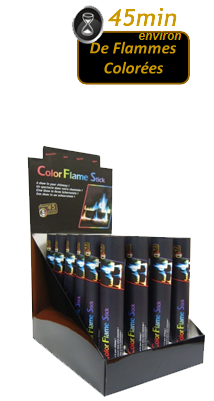 Additives will continue to be released and any unburned residue will be reduced to ash when you set your next fire. Never close the fireplace damper before the ashes are cold and until combustion is complete. After using SECURIFLAME chimney-sweeping log , from time to time inspect the top of the damper and the mantelpiece (if the chimney has one) to make sure they are free of tar particles. 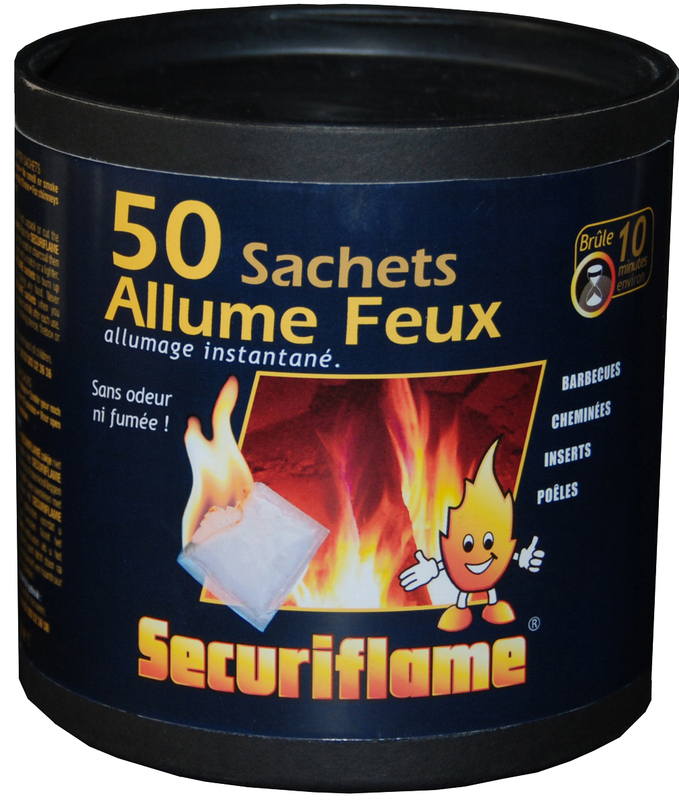 This is particularly important if a great deal of tar has built up before using SECURIFLAME chimney-sweeping log . Remove any debris using a curved brush or a water and dust vacuum cleaner. If your wood stove has a horizontal or bent flue, inspect the flue and remove any debris that may have built up in it. Generally, installing a chimney cowl is effective against back draft problems caused by the wind. If the room in which the fireplace is located is not well aired, open a window (on the prevailing wind side). 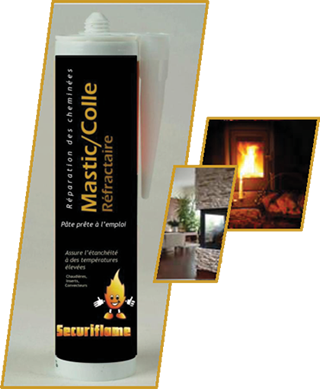 SECURIFLAME chimney-sweeping log can be extinguished in an emergency. Carefully pour water on to the Log or cover it with sand. Never let children play near a fireplace, a hot wood stove or any wood-burning equipment. Any failure to follow these instructions and warnings can result in incorrect operation or a risk of injury or fire. Een heerlijk brandend kachelvuur is voor iedereen een genoegen. Maar om dit genoegen blijvend en veilig te maken, heeft de kachel iedere dag zorg nodig. Om hem moeiteloos aan te kunnen steken, om een goed en warm vuur zeker te stellen, of voor een perfect onderhoud van de haard zelf, SECURIFLAME heeft alles in huis en in voorraad om uw haardleven te vereenvoudigen. ONTSPAN U MAAR BLIJF OPLETTEND ! De grootste kwaaddoener is vervuiling van de pijpen. Tijdens het branden, komt er teer, hars en roet vrij uit het hout. En dit alles wordt omgezet in een ontvlambare aanslag dat glasgruis genoemd wordt, dat bestand is tegen de gebruikelijke schoorsteenveger bezem, tegen krabbers en zelfs tegen de bijtel! Meestal manifesteert dit zich door een verstopping van de pijp en men zegt dan dat de “schoorsteen niet trekt”! Let op, dit is het eerste teken van een aantasting die uiteindelijk kan leiden tot schoonsteenbrand. Heden ten dage, is het heel duidelijk : om de huishoudelijke lasten te drukken en toch te kunnen genieten van een hoog comfort, is houtvuur de perfecte oplossing. Het eerste principe van de houtverwarming is het tot stand brengen van een warmte diagnose van het huis. De meest gangbare berekening rust op een uitwendige temperatuurbasis van 0° en een huis dat is geïsoleerd volgens de EDF normen. Men gaat ervan uit dat men 50 Watt nodig heeft om 1m3 te verwarmen; bijvoorbeeld als het hoofdvertrek 60 m² groot is met een plafondhoogte van 2,5 meter, moet u een ruimte van 150 m2 verwarmen. De warmtebehoefte bedraagt dus 7500 W ofwel 7,5 KW. Na het maken van uw eigen berekening, wat moet dan het rendement van uw kachel zijn? Kijk hiervoor eenvoudigweg op de handleiding van de fabrikant in de wetenschap, bijvoorbeeld, dat een inzetkachel met warmtewisselaar een rendement van 10 tot 15 kW afgeeft. En voor een traditionele kachel voorzien van een gietijzer plaat, verschilt het rendement min of meer maar bedraagt op zijn minst 5 kW. U wilt een warme winter? Pak dan uw calculator. Meet de afstand tussen het rookafvoerkanaal en het dichtst in de buurt staande brandbare elementen, deze afstand moet op zijn minst 16 cm bedragen. U houdt van zichtbare balken? Vergeet dan niet dan hout verbrandt vanaf een temperatuur van 150°C en dat een goed houtvuur een temperatuur van 550° kan overschrijden. HOUT IS GOED, IS ECONOLOGISCH ! Het gebruik van hout houdt zeer zeker niet in dat men aldus bossen vernietigt. Het is juist omgekeerd, aangezien de vraag naar hout steeds toeneemt, is men ertoe gedwongen de bossen heel nauwkeurig te beheren, te onderhouden en in goede staat te houden. In Frankrijk groeit het bosoppervlakte gestadig en wordt constant vernieuwd. Laten we hier profijt van trekken. We kunnen dus gerust hout verbranden, ok, maar welk soort ? In de eerste instantie moet u hard en goed droog hout nemen, het zal langer branden. Het beste is te kiezen voor eiken, haagbeuk, beuken of essenhout, deze houtsoorten vervuilen de pijpen minder snel dan harsachtige houtsoorten. Maar blijf vooral uit de buurt van ruwe berken, dit hout gaat zeer gemakkelijk aan, dat is waar, maar verbrandt even snel als een vloeitje. De noodzakelijkheid om de schoonsteenpijp te isoleren is vrij recent. De inspanningen van de fabrikanten van verwarmingsapparaten om het energieverbruik te drukken hebben echter ook ten gevolge dat de gas emissie temperatuur ook daalt. En deze lagere temperaturen in de pijp kunnen een probleem veroorzaken in installaties waarvan de isolatie niet toereikend is om het hoofd te bieden aan het koud effect van buiten af. Het isoleren van de pijpen op de zolder en boven het dak zorgt ervoor dat de gassen niet al te snel afkoelen. En soms stroomt de rook terug naar binnen. De warme lucht binnen heeft de neiging naar op te stijgen en is minder dicht dan de koude lucht van buitenaf. Deze neiging om naar boven te gaan van de warme lucht, produceert een luchtdruk die iets hoger is dan de neutrale druk in de bovenste gedeelten van het huis en een iets lagere druk in de onderste delen van het huis. In de lagere delen van het huis kan het bovendien voorkomen dat de ventilatie niet goed werkt, in het bijzonder wanneer de verwarmingsinstallatie de pijpen naar buiten toe afvoert (pijp tegen de uitwendige muur aan). Uitwendige pijpen genereren immers een lagere luchtstroom. Als de kachel, of de haard, brandt, wordt er een warme luchtkolom gevormd die omringd wordt door koude lucht. De turbulenties van de warme gassen hebben ten gevolge dat de lucht heel natuurlijk naar boven toe wordt gezogen. En in de wintermaanden is uw huis zelf ook een warme luchtkolom. De warme lucht binnen creëert op zijn beurt ook een « luchttrek » wat het ontstaan van overdruk ten gevolge heeft in de hogere delen van het huis. Tegelijkertijd, gaat de luchtdruk onder in het huis naar beneden waardoor er minder lucht bij uw kachel komt. Dit is de reden waarom, in het geval het lage gedeelte van het huis niet voldoende geïsoleerd is, de koude lucht van buiten zonder problemen naar binnen kan gaan. Dit drukverschil binnen wordt ook wel het depressie effect genoemd. En dit depressie effect treedt in concurrentie met uw haard of kachel als deze geïnstalleerd is in het voornoemde lage gedeelte van uw huis. Een goede installatie, naar behoren geïsoleerd, met een pijp binnen in het huis, niet tegen de muur aan, kan dit depressie effect tegengaan. Daarentegen zal een niet goed geïsoleerde haard of kachel, geïnstalleerd op een ongeschikte plaats of met ongeschikte afmetingen en vermogen, niet dit depressie effect tegen kunnen gaan wat een terugloop van rook naar binnen ten gevolge zal hebben. Als de wind naar uw huis toe blaast, genereert hij een positieve luchtdruk aan de zijde van het huis waartegen hij blaast. En een negatieve luchtdruk aan de zijde waar hij niet blaast. Dit luchtdruk effect hangt uiteraard af van de ligging van uw huis, zijn vorm en de mogelijke gebrekkige isolatie binnen. Als er luchtlekken zijn aan de zijde beschermd tegen de wind, kan de wind een depressie creëren die zo hoog is dat de rook teruggestuurd wordt naar binnen. In dit geval, biedt het openen van een raam aan de windzijde vaak een toereikende oplossing. Het openen van een raam aan de zijde beschermd tegen de wind zal alleen maar het verschijnsel verergeren. Het belang van mechanische ventilatie installaties en overige ventilatie apparaten. De meeste huizen zijn voorzien van één of meerdere lucht extractie apparaten. Zoals de wasemkap en de ventilatie in de WC en de badkamer. Ventilatie badkamer : 10 tot 20 M 3 per uur. VMC (mechanische ventilatie inrichting): 25 tot 40 M 3 per uur. Als een extractie apparaat op volle toeren draait, is de luchtdichtheid van de deuren binnen niet meer toereikend. Mocht de rook terugstromen naar binnen toe, moet u de luchttrek van uw lucht extractie apparaten lager zetten. Het huis als een systeem. Alle eigenschappen van uw huis, plus de hieronder omschreven invloeden van buitenaf, kunnen de goede trek van uw schoorsteen aantasten. De uitdaging bestaat eruit om deze invloeden te onderkennen en hun negatieve effecten op uw kachel of haard terug te brengen. Het idee « Het huis als een systeem » vormt een goede manier om het huis te aanschouwen als een compleet systeem met talrijke verschillende elementen. Het is natuurlijk wel duidelijk dat de haard of de kachel een dynamisch systeem is dat wordt beïnvloed door het huis zelf. Het terugstromen van lucht in het huis produceert een schadelijke lucht. Deze lucht moet als beschouwd worden als zijnde een tekortkoming van het ventilatiesysteem of veroorzaakt door een gebrekkige isolatie van het huis. Always check the flue is clear (branches, nests, leaves). Gebruik altijd ‘droog’ hout of bij gebruik van groen hout, verzaag het heel klein en meng het met droog hout. Het plaatsen van een kap van goede kwaliteit op de pijp maakt het doorgaans mogelijk om het terugstromen van rook naar binnen veroorzaakt door de wind, te verhelpen. Het gebrek aan luchtdruk in het vertrek kan worden verholpen door het open zetten van een venster aan de zijde waar de wind blaast. Zorg ervoor dat de ventilatie apparaten (mechanisch, wasemkap enzovoort…) uitgeschakeld zijn. De pijp is te klein of te groot. Er heeft zich te veel teer in opeengehoopt. Het huis is te ‘luchtdicht’ of er kan niet voldoende lucht komen in uw schoorsteen. Basis gegevens: Wat gebeurt er precies tijdens de houtverbranding. Water verdamping : water kan 50% van het gewicht van een blok groen hout vertegenwoordigen. Na de juiste periode van drogen, wordt dit percentage teruggebracht tot 20%. Tijdens het verbranden, gaat dit water koken en verbruikt hiervoor warmte energie. Hoe natter het hout, zoveel te meer warmte energie het zal verbruiken en dit gaat ten koste van de warmte restitutie naar binnen toe. Rook emissie: zodra het hout warm wordt tot boven het kookpunt van water, gaat het roken. Rook is het zichtbare resultaat uitzetting van vast hout, in een wolkje van brandgassen en fijne teer druppeltjes. Deze rook vat vlam als de temperatuur hoog genoeg is en als er zuurstof aanwezig is. Als de rook gaat branden, produceert hij de prachtige vlammen die de houtverbranding kenmerken. Als de rook niet gaat branden, stijgt hij in de pijp waar hij gaat condenseren en teer en roet zal vormen. Niet verbrande rook vormt een groot deel van de hout energie. Koolstof fase : Tijdens het branden en terwijl de meeste gassen en het meeste teer in stoom worden omgezet, blijft de kool achter. Kool bestaat nagenoeg voor 100 % uit koolstof en kan branden met rode kolen en heel weinig rook. 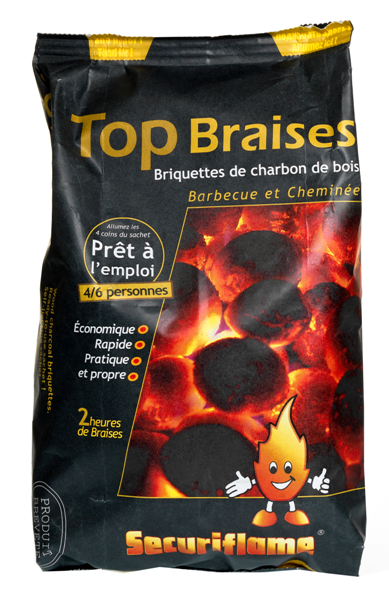 Kool is een uitstekende brandstof die moeiteloos en schoon brandt als er zuurstof bij kan komen. Q12) Ist der Gebrauch des SECURIFLAME-Reinigungsscheits in einem Ofen mit Katalysator möglich? 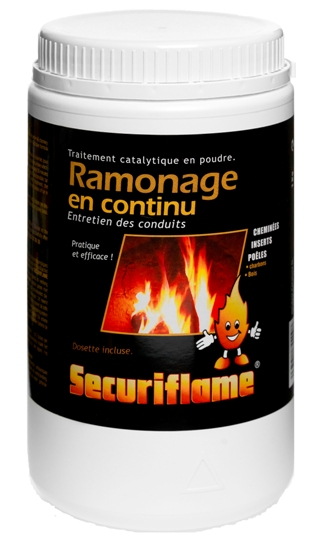 Bij gebruik van het Schoonmaakblok SECURIFLAME of de Pellet's Clean SECURIFLAME, krijgt u gratis een persoonlijke garantie. 1-Bij schoorsteenbrand, vult de Garantie de door u elders afgesloten brandverzekering aan (woningverzekering). .
2-De Garantie dekt het eigen risico en/of de aftrek voor verouderde staat die u zelf moet betalen na vergoeding van uw brandverzekering en tot een maximaal bedrag van 5.000,00 €. De garantie treedt in werking op de 16e dag na de datum van gebruik van het product waarbij het poststempel tot bewijs strekt wat betreft via de post verzonden brieven. Door de Garantievoorwaarden te aanvaarden, gaat u de verbintenis aan het product te gebruiken volgens de aanbevolen voorwaarden. Het feit dat u het product niet hebt gebruikt is heel eenvoudig na te gaan. Indien u het product niet hebt gebruikt, kunnen onze garantie en aansprakelijkheid beslist niet ingeroepen worden in geval van schade. © Tous droits réservés, les produits présentés sont des marques déposées.